Legs of spring must be positioned and pretensioned before the pin is installed. (b) Hold spring (2) short leg in this position and turn long leg 1/2 turn clockwise (as viewed from front of receiver (3)) to increase spring tension. (c) Position long leg of spring (2) to be on inside of cover (1) when it is closed. 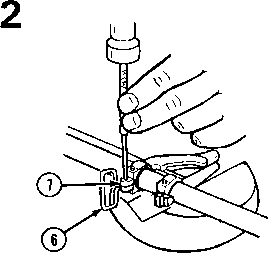 Hold spring and cover in this position and install pin (4) and retaining ring (5). 2-19. UPPER RECEIVER AND BARREL ASSEMBLY (CONT). 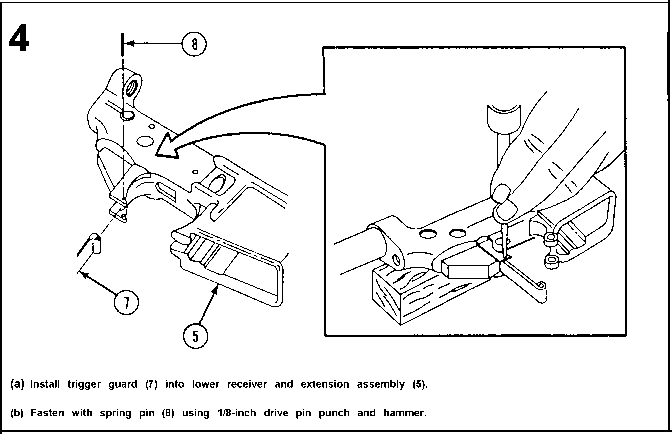 If previously disassembled, position sling swivel (6) and install new tubular rivet (7) using center punch and hammer to spread and flare the hollow head of the tubular rivet.